Summer is about to arrive, bringing gorgeous sunshine for your beach sessions, poolside Piña Coladas, ice-cream covered children’s faces, and of course sunburn! With so much contradicting and confusing information regarding summer skincare, it can be hard to find relevant, accurate information that can really help. We’ve done the hard work for you to make sure you don’t fall victim to sun damage and can take the necessary steps to protect your skin with Viora’s summer skin survival tips. Keeping hydrated is fundamental in ensuring beautiful, glowing skin throughout the hot summer months. Increased temperatures combined with spending more time outdoors often results in higher levels of water loss and dehydration as a result of sweating and perspiration. This can wreak havoc on your skins feel and appearance so make sure you are continuously replenishing your body’s supply of water. Stay a step ahead of the heat and lookout for tell-tale signs of dehydration including headaches, lethargy and dry skin and lips. Pro tip – Give yourself a vitamin C boost by adding a squeeze of orange juice to your water which will help repair and maintain better skin. Your body and taste buds will thank you for it. Target hydration at its root with an Intensive Hydration Facial Treatment powered by Viora’s cutting edge technology. Our Infusion™ electro-mesotherapy device combined with Ampoules containing all-natural serums, proteins and healing agents have been specially developed to penetrate and treat your skin on a cellular level. 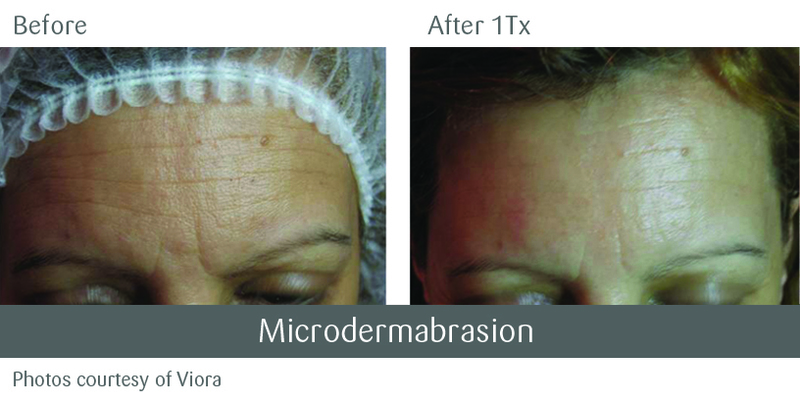 Get stunning results today from just a few sessions at a treatment provider near you. While ice-cream and take away from the boardwalk might be a convenient summer snack on your way home from the beach, don’t underestimate the important role that food plays on your skin and its appearance. Try and distance yourself from fried foods which have a high glycemic index, and packaged foods which are filled with preservatives and additives as they are known to cause blood sugar level spikes, restricting your skins ability to produce collagen and maintain skin elasticity. You should also lower your intake of sugars, alcohol and caffeine which have been known to cause skin inflammation, collagen damage and dehydration, especially during summer. Don’t despair! While there are lots of foods to avoid, a range of healthy, tasty options exist for your culinary satisfaction and skin perfection. Apples and watermelons are rich in antioxidants and nutrients that give your skin a boost and serve as an ideal snack between meals. Fish is loaded with Omega-3 and fatty acids which can help reverse sun damage while protein rich legumes do wonders for skin cell regeneration and repair. Take charge of your skin care during summer by limiting the impact of those pesky UV rays. Start out by accessorizing your new swim suit in ultimate style and skin safety with an all-natural floppy straw hat to stop UV rays directly reaching your face, neck and shoulders. If you do plan on spending some time under the sun, aim for the morning or late in the afternoon when the sun’s rays are less harmful than during the hotter afternoon hours. We recommend gentle exfoliation treatments throughout summer when your skin is more exposed to the sun. Pristine procedures can give you a customizable, clean exfoliation treatment that will remove dead skin cells and allow your skin to breathe and regenerate better. With 13 different diamond tips an exfoliation procedure with Pristine can be completed on a wide range of skin types and symptoms. Of course, there are few substitutes for high quality sun-screen to achieve maximum skin protection, but with a seemingly endless selection choices, finding the right lotion for your skin is a daunting task. Try looking for sunscreen that is at least SPF 30+, water-resistant and blocks both UVA and UVB rays. Be sure to re-apply every 2 hours and don’t overlook your legs and feet, they can also get burnt! Following these basic tips will maximize your chances of maintaining beautiful skin through summer, but if you should find yourself a victim of sunburn, begin treating your skin as soon as possible. While damage that has already been done cannot reversed, there are things you can do to relieve pain or irritation cause by overexposure. Avoid the sun as much as possible so your skin is not further damaged and use aloe vera or a wet towel to cool and sooth the skin. Applying moisturizer will help alleviate skin dryness that may have developed, as does giving your body a boost of water to hydrate. If peeling occurs or blisters develop, resist the urge to pick, peel and pop as this will slow the skins natural rejuvenation process. To achieve the ultimate bikini body this summer, look no further than Viora’s innovative full body contouring and cellulite reduction treatments for a more defined, smoother skin appearance. Powered by our patented CORE technology with multiple RF channels, you can produce extremely natural, long lasting results in very minimal time. Make sure to share this information with your family and friends, and follow Viora on Facebook and Instagram for more great articles and information, as well as details about our cutting edge products offering a wide range of treatments to keep you looking fabulous.